heron through the trees, originally uploaded by jahansell. 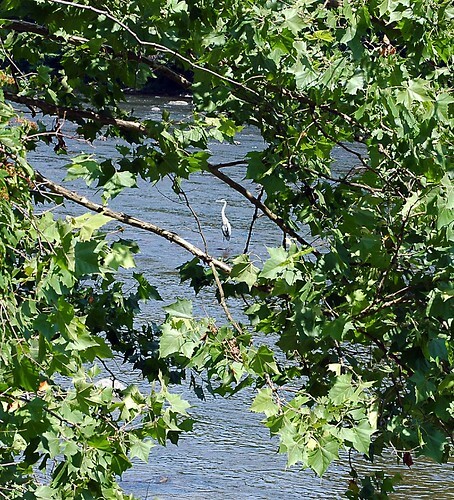 I drove up Route 7 along the Housatonic River yesterday and spotted this Great Blue Heron out in the water. I couldn't get much closer - my lens isn't long and as soon as it spotted me it flew. PS the odd post that was here for a while last night and this morning really belonged on my triathlon diary - sorry for the error! I posted a phot of a heron the other day; same problem I couldn't zoom in far enough...walked through so may stinging nettles to get the photo I did...luckily my heron didn't fly away. This is a great shot.....and a triathlon...wow...I am impressed! The last heron I took a photo of I didn't know it was there until I downloaded the photo on to the computer and discovered it.